The name really says it all, but I’m just going to say it again – this is the BEST granola. But seriously, it has taken me a long time to find a granola recipe that is perfect for our family’s taste buds. This makes a big batch, so use a big bowl! This recipe makes a huge batch of granola – so if you have a smaller family, you may want to half the recipe. You can also just eat it all. Or use some of it instead of oatmeal when you make cookies next. And of course, you can always bag it up and give it to neighbors and friends. I’ve also listed all of the ingredients by both volume and weight. Honestly, who wants to measure out 10 cups of oatmeal? So, if you have a scale, this is the time to use it. Just plop your empty bowl on the scale, zero it out, and then start adding and weighing ingredients as you go. This recipe is pretty low on the sugar as far as granolas go. That is probably reason enough to make your own. The granolas you find at the grocery store or farmer’s markets all have tons of sugar in them. It’s why they are so darn good. But that sugar is definitely not good. So, while we need some sugar in the recipe, I’ve tried to keep it as low as possible while still ending up with something that people want to eat. When you get ready to put the granola in the oven, spread it out on two pans. I like to use parchment paper on the pans – it helps with clean up and you can use the parchment to move the cooled granola into it’s final storage container. 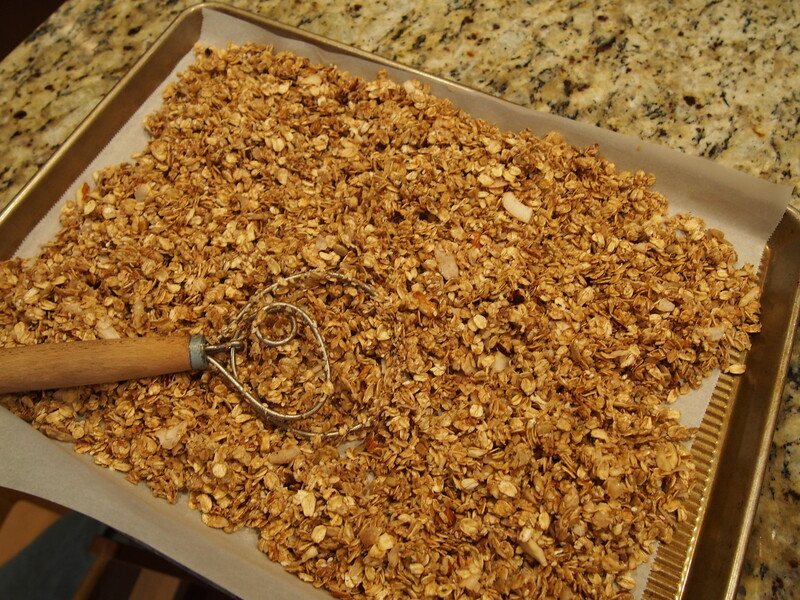 After you bake the granola, try to leave it on the trays to cool in the oven – turn the oven off and leave the door shut. 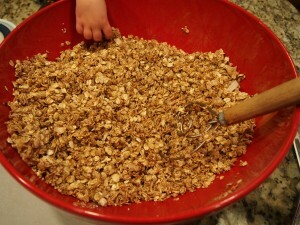 The granola will crisp up and form little chunks as it cools. If you bake the granola in the afternoon, you can go ahead and let it cool in the oven overnight. Spread the granola out on trays to bake. Heat oven to 250 degrees. Line two jellyroll pans with parchment paper. 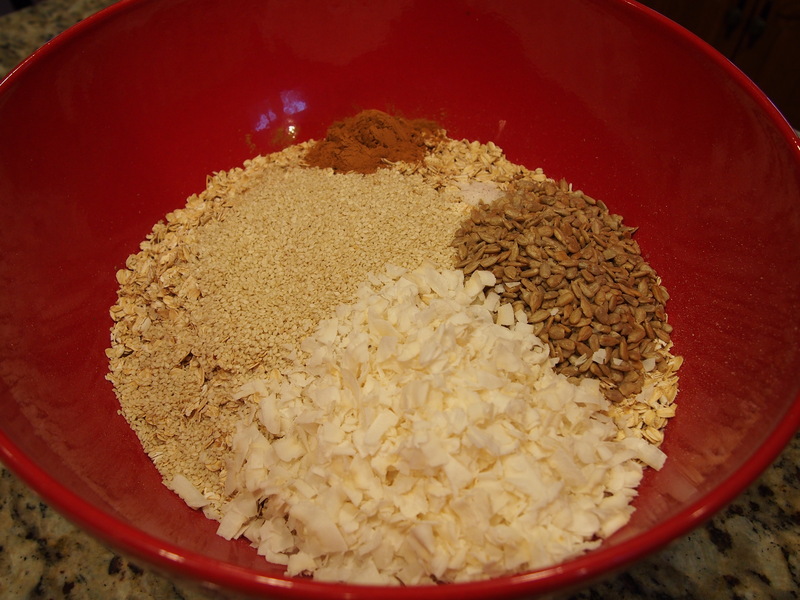 Combine oats through cinnamon in a large bowl. Combine remaining ingredients in a small bowl. Pour wet ingredients over dry ingredients and stir to combine. Divide granola onto prepared pans. Bake in preheated oven for a total of 80-90 minutes. Every 30 minutes, stir granola and rotate pans in the oven. 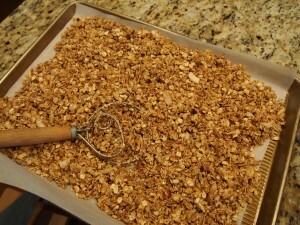 Once the granola is nice and toasty brown, turn off the oven and let cool in the oven, 6-8 hours. As it cools it will get crispy and form small chunks.